This past Sunday, my message was about joy. I spent some time making the distinction between joy and happiness. I quoted C. S. Lewis. I think he came really close to explaining the Biblical meaning of joy when he called it the “unsatisfied desire which is itself more desirable than any other satisfaction.” That statement is a little obscure at least on the surface. However, he went on further to say joy “must be sharply distinguished both from happiness and from pleasure.” He had experienced real joy and knew that it isn’t based on external or circumstantial happenings but on Christ in our lives. No matter what is happening in our life…good or bad with Christ we can have joy. My prayer is that we all experience that kind of joy. Wherever there is jealousy or selfish ambition, there will be disorder and every other kind of evil. So rid yourself of resentment today. Seriously, let it go. Allow God to take it. It will bring freedom to your life. You will experience joy. Then take your next step and Focus on healing rather than hurting. Listen, fear in our lives changes our lens and therefore impacts the way we encounter others. Fear does three things to a relationship. Fear makes us defensive as we are worried about what others might do to us. We become distant because of our inward fear of vulnerability and put up walls around ourselves. We find ourselves demanding because we’re afraid and we must always be in control. Realize this; God hasn’t given you the spirit of fear but power, love and a sound mind. Allow God’s power to work in your life today. Pray first asking for God’s power and for The Holy Spirit to empower you. Then take your next step and Focus on God’s power rather than your problems. The secret to relationships is perspective. His power is greater than your problems. Shift your focus to Him. Choose this Christmas season to experience a new perspective and focus. 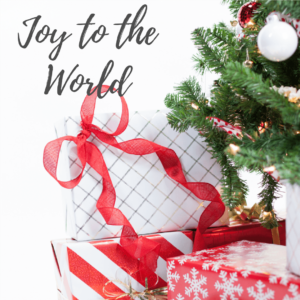 It’s a “Joy to the World” season. Take your next step and let joy into your world, so you can proclaim joy to the world. Martyn Lloyd-Jones said “The world has never seen anyone who knew joy as our Lord knew it, and yet He was a man of sorrows and acquainted with grief.” Allow your life to be filled with joy like Jesus. No matter what, joy can be yours.